COMMENTS: The Crooked Notches puzzle is number 97 in Stewart Coffin’s design listing. The puzzle is made of six symmetrical pieces, three of each of two kinds of pieces. 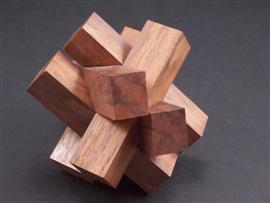 This puzzle started out as a simple six piece diagonal burr, then compressed along one of its threefold axes. The result is that the square sticks are now rectangular and the notches are crooked. This adds some confusion when trying to assemble it and may take a little trial and error to get the pieces in the correct positions. Each puzzle is signed, numbered, and dated by the artist.